Nursing home residents enjoying the day fishing with area Boy Scouts on Wednesday at Anzalduas park in Mission. MISSION — Making new friends and fishing was to objective this week in the inaugural intergenerational fishing derby held at Anzalduas County Park. Bringing the old and young together and becoming friends was to be expected in this unique event. Twenty-five nursing facility residents from Mission Nursing Home, Retama Manor in Edinburg, Retama Manor in Rio Grande City, Harlingen Nursing facility and Weslaco Nursing and Rehab all participated and were paired with 25 Boy Scouts from Troops 272 from Sharyland and 83 from Mission. Shelia Shelton, Molina Healthcare engagement coordinator manager for the state, said that once a patient goes into a nursing facility that the memories are often lost by the residents. The fishing event is one way the organization is trying to provide improved quality of life is for the residents living. “It is our passion to keep creating new memories for the residents by giving them events outside the nursing facility as well as inside,” Shelton said. The day started with a flag ceremony as Wednesday was Flag Day. In addition, a park ranger gave a wildlife presentation to the participants. 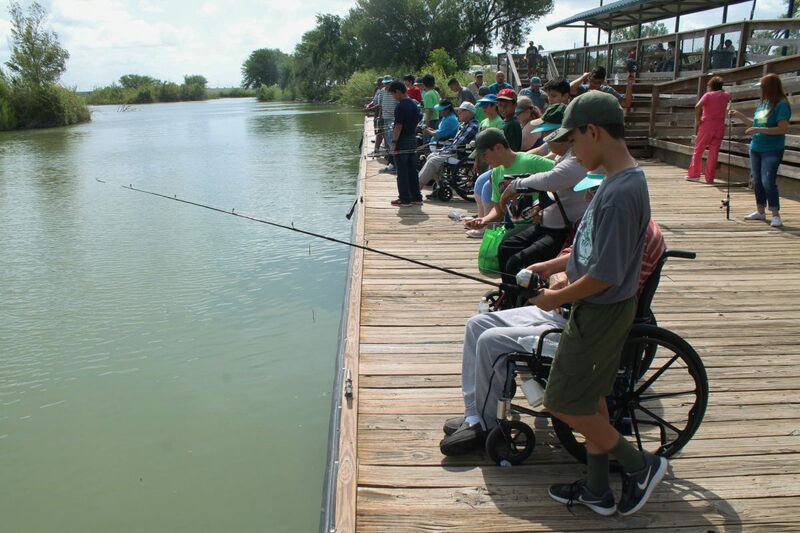 Juan Rivera, Molina Healthcare community engagement coordinator for the Rio Grande Valley, was behind the idea for the fishing event and wanted to have the interaction to create memories for the residents and also the Boy Scouts. Debra Fontana, a Retama Manor resident from Rio Grande City, said that she fished when she was growing up and she hadn’t done it in a long time. As part of the fun, Molina Healthcare volunteers also gave awards for the biggest catch to the first, second, and third place finishers. “I liked it — like helping the elderly fish — and would do it again,” said 11-year-old Boy Scout Robert Arriaga of Troop 272 and a Mission resident. “This was for them (Boy Scouts) to be with the older generation and remove the stigma of nursing homes and the residents,” Shelton added. As a wrap-up, Dr. Cleo, Molina’s cat mascot, along with healthcare volunteers presented the Boy Scout troops with a Molina patch for their uniforms to mark their service. The event was sponsored by Molina Healthcare of Texas in-partnership with the Boy Scouts of America.